The world got its first glimpse of Delta’s new uniforms Tuesday at an exclusive event in Atlanta. Acclaimed fashion designer Zac Posen partnered directly with Delta employees from nearly every work group to design the new collection over the last 18 months, developing a functional wardrobe fit for Delta’s diverse employee group and the environments where they work. Employees influenced the design and final selection of each uniform piece. Posen designed the uniforms for Delta’s above-wing Airport Customer Service, Delta Sky Club and In-Flight Service employees, while consulting on the uniform project with global lifestyle retailer Lands’ End for below-wing Airport Customer Service, Delta Cargo, Ground Support Equipment Maintenance and Delta TechOps employees. Lands’ End will manufacture and supply the uniforms to approximately 60,000 Delta employees worldwide. The collection presents a cohesive look across customer-facing and technical job functions, fusing together bold color palettes with classic style. It features innovative, versatile fabric that stands up to the active, fast-paced airport and on-board environment. All of the colors are airline-themed, including Passport Plum, Cruising Cardinal and Groundspeed Graphite, with accents of Skyline Slate and Traveling Thistle. “The new uniform collection will be a strong brand statement and builds on our team members’ sense of pride as they serve our customers around the world,” said Gil West, Delta’s Senior Executive Vice President and Chief Operating Officer. 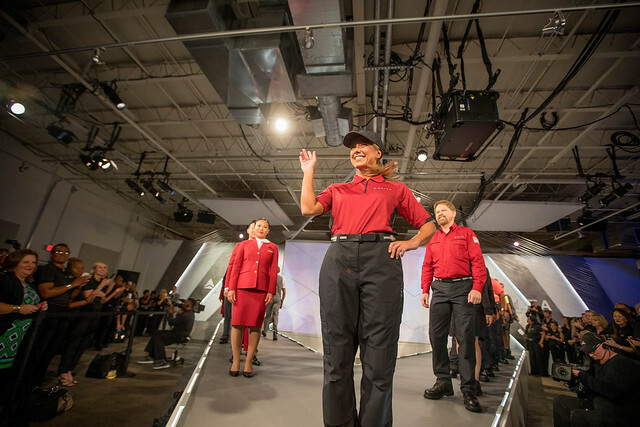 Following the reveal, Lands’ End will begin crafting final uniform prototypes for Delta's 1,000 wear testers, who will be sporting the uniforms on the job from December-March 2017. These wear testers will identify any changes needed to improve fit, form or function before the final garments are produced. The airline last updated its uniform collection for above-wing employees in 2006, including flight attendants and airport customer service agents. The uniform collection for below-wing employees, including technical operations employees and ramp agents, was last updated in 2000.